We’d love your help. Let us know what’s wrong with this preview of Work & Wagers by Sherrie Sushko. Between the investigation of an unsolved murder, an understaffed office, and the development of an alluring new friendship, there's never enough time to play for P.I. David Wagers. But make no mistake -- David Wagers is not a dull boy. To ask other readers questions about Work & Wagers, please sign up. This book is very poorly written with poor grammar, a transparent plot and poorly developed characters. An excellent example of how not to write. David Wagers is a Private Investigator who has been hired to look into the murder of Courtney Tabbin. Courtney was murdered about a year ago and the police had been unable to find the killer. Courtney was working in the legal department of Well Metro, a health insurance company, at the time of her death. The night she was killed, she was supposed to meet with some of her co-workers for dinner, but never showed up. In the course of his investigation, David found that Courtney had been pulling away David Wagers is a Private Investigator who has been hired to look into the murder of Courtney Tabbin. Courtney was murdered about a year ago and the police had been unable to find the killer. Courtney was working in the legal department of Well Metro, a health insurance company, at the time of her death. The night she was killed, she was supposed to meet with some of her co-workers for dinner, but never showed up. In the course of his investigation, David found that Courtney had been pulling away from her old friends, which may have caused some friction. While looking into the people at Well Metro, David meets Victoria Carols. Although she is unaware of it, she replaced Courtney in the legal department. Victoria agrees to help David by "asking around" at work. Victoria discovers that there was some jealousy between Courtney and one of her co-workers. David is pretty sure he knows who killed Courtney, but can he prove it? Will helping David put Victoria's life in danger? The story is very well written with good character development, however, there could have been more background information on David Wagers. The story seems to be more of a "Can we prove it" than a whodunit mystery. I am definitely looking forward to more books in this series. Excellent read. Great flow, well written. Couldn't put the book down, characters and plot kept my interest. Can't wait to read more from this author! NYC. Walter Huffs (attorney) niece Courtney Tabbin (college graduate, graduate student, lawyer, paralegal) had been brutally murdered at the Well Metro health insurance co in New Jersey & the crime was still not solved. Walter had hired David Wagers (PI) to see if he could solve the case. Penny Irvine (45+) had hired David to keep & eye on her spouse Troy Irvine to see if he was cheating on her. David went to see Joanne Tabbin (wife, Courtney’s mother/David’s sister). Nora Mulligan (Courtne NYC. Walter Huffs (attorney) niece Courtney Tabbin (college graduate, graduate student, lawyer, paralegal) had been brutally murdered at the Well Metro health insurance co in New Jersey & the crime was still not solved. Nora Mulligan (Courtney’s manager), Darlene (HR), Pam Jobley (top paralegal), Victoria Carols (Richard ex-fiancé, PT paralegal internship), Ava Temones (secretary), Marsha Jones (secretary), Phyllis Morgan, Frannie Simms, Henry Molinger (IT tech) & Matthew “Matt” Richies (IT, DE), were all employed by Well Metro health insurance co.
Steve Boke (Courtney’s ex-BF, college student, Connecticut) was on David’s list next. Next Dawn Castanova (Courtney’s BFF, editor, small publishing company) was interviewed. Pam was going to rent an apartment from the Tabbin’s. What did Pam tell Ava to do? Is there something going on with Steve & Dawn? David finally talked with Henry who had been dating Courtney at the time she was murdered. Rumor has it he is now dating Pam. Will David solve the murder mystery? Will he uncover something else? A very awesome book cover, great font & writing style. A very well written office murder mystery book. It was very easy for me to read/follow from start/finish & never a dull moment. There were no grammar/typo errors, nor any repetitive or out of line sequence sentences. Lots of exciting scenarios, with several twists/turns & a great set of unique characters to keep track of. This could also make another great office murder mystery movie, or a mini TV series. A very easy rating of 5 stars. This is a good quick read. You will not want to put it down, one of those great books that you can get completely lost in. I had to finish reading through even as I saw where it was going. You just couldn't put it down before finding out just how it was going to play out in the end. Wonderful mystery! This was a very good book, but the storyline was so straight forward with no real twists. I would enjoy reading more, but hopefully with a bit more surprises. David Wagers, the central character in Work & Wagers: (David Wagers Case #1), is hired by an attorney to investigate an unsolved murder. So far so good. Most of us who enjoy detective mystery novels don't care to settle for any crime other than a good murder. I found the pace of the book to be noticeably slow until about the halfway point. Once Wagers started to unravel the mystery, from that point on, the book became a more compelling read. 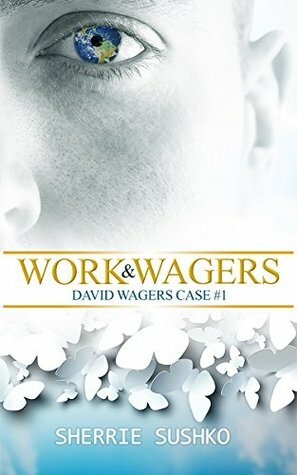 In comparison to the noir-type detective novels I u David Wagers, the central character in Work & Wagers: (David Wagers Case #1), is hired by an attorney to investigate an unsolved murder. So far so good. Most of us who enjoy detective mystery novels don't care to settle for any crime other than a good murder. In comparison to the noir-type detective novels I usually read, this book was near literary in style. But that handicaps the book to a degree in my opinion. I found it fairly difficult to connect with the characters, particularly the protagonist. I really didn't feel like I knew any more about Wagers at the end of the book than at the beginning, beyond a few sundry facts. Despite all that, I was still able to enjoy the book. As far as the plot goes, there were some twists and moments of suspense that helped maintain interest, but I was quite confident who the murderer would turn out to be, long before reaching the end and in fact the villain was the person I expected it to be.